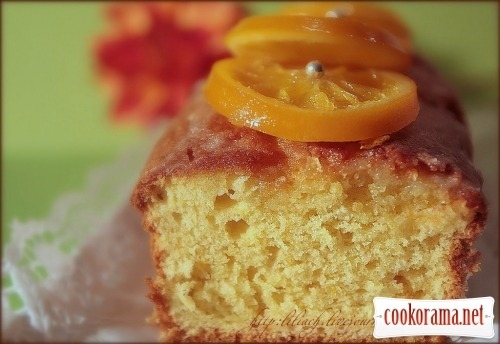 Fragrant, juicy, incredibly delicious cake! If to soak it with syrup after candied broth, it will be even more gentle. Heat the oven at 180℃. Separate whites from yolks. Slightly mix yolks with sugar. Add room temperature butter and mix till cream structure for about 3 min. Add peel, juice, vanillin, mix it. Add flour and baking powder. Mix dough into smooth structure. In a separate bowl mix whites with pinch of salt into hard peaks. Carefully mix whites in dough. Pour dough in greased form for cake and bake for about 45-50 min or till readiness. Let the cake cool a bit and remove from form. Glaze: Mix peel and orange juice with sugar powder, to avoid clumps. * you can need more sugar powder, it depends from the amount of juice in orange. As soon as cake cools, grease it with glaze from all sides. Decorate surface of cake with candied oranges and serve. Slice 3 small oranges. Fill saucepan with water. As soon as water boils, gentle put oranges in water and and stew them for about 5 min. Pour water out. Repeat the procedure for 3 times. Pour in the saucepan 1 1/2 glass f water and 1 1/2 glass of sugar, put on fire. When sugar completely dissolves in water, add orange slices and boil them in syrup over low heat for 45 min. During this time flip them several times. Carefully remove oranges and put them on parchment paper to dry. In principle, this amount of oranges is quite big for 1 cake, you can make from 2 oranges. It is not necessary to make candied oranges, but they will add highlight for cake and give it completeness. This method can handle any citruses. 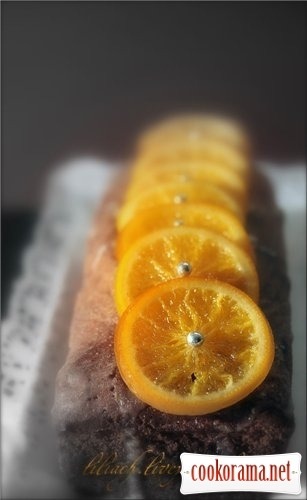 Top of recipe "Orange cake with candied fruit"